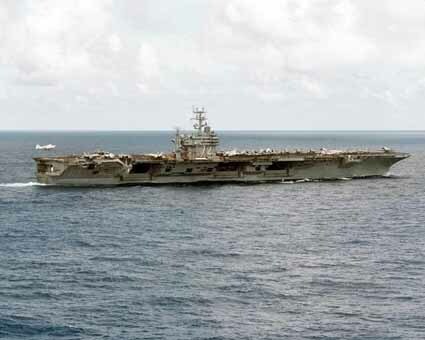 Abraham Lincoln, also known as Abe is a Nimitz-class super carrier launched in 1988 and commissioned in 1989 out of Washington. Abe began her career after a transfer to the Pacific fleet, in Operation Desert Shield/Desert Storm. En route, she unexpectedly helped rescue 45,000 military personnel and families from the Philippines as part of Operation Fiery Vigil, following the eruption of Mount Pinatubo. After this humanitarian diversion, she continued on to the Persian Gulf to assist in Operation Desert Storm. She came to the rescue of the USS Sacramento, when she had mechanical difficulties, and continued her assigned mission. Abe also assisted in the international relief effort when a large earthquake hit southern Asia in December of 2004. She continued to provide important support and supplies, including 5.7 million pounds of supplies, until February 2005, when the hospital ship Mercy arrived. Abe was also the site of President G.W. Bush’s infamous “Mission Accomplished” speech, which for the record, was the idea of the crew of Abe. She has received several awards including the 2009 Franklin Covey Leadership Greatness Award.